A Backbreaking Misadventure in the Himalayas. A psychedelic odyssey like no other, spanning the exotic foothills of the eastern Himalayas. In the summer of 2011, two bleary-eyed kids, teetering on the cusp of adulthood, decide to drop out of the daily grind and just travel. But once they hit the road, their plans go out the window. Soon, they are barreling over potholes the size of lunar craters in Nepal, bungee jumping in Rishikesh, waking up to Buddhist chants in Sikkim and cycling down the world's highest motorable pass in Ladakh. On the way is a constant stream of oddballs, like the five-second-tea lady, the flute-playing hotel manager, flying Sonam, reggae junkies and many more this journey is all about rolling with the punches. Special Lassi is one part funny, two parts crazy and a whisper of wistful-for the best things are ephemeral and a lust for life is a dangerous thing. 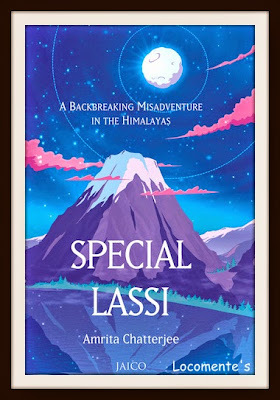 Amrita Chatterjee is a unicorn who likes to frolic in her mythical la-la-land, and surfaces occasionally to check on the real world. But the lights are brighter on the other side and she hopes you will follow her there, if only for a while. To begin with, the cover page of the book is dipped in sky blue and has images of a beautiful mountain, Himalayas with a full moon shining above it. It suits perfectly to the book’s theme. The title is intriguing and doesn’t give away the meaning. Does it mean the tasty Punjabi lassi or something else? The story answers that though. And, the book blurb briefly tells that the book is a travelogue. The story is about the author and her Friend River who step out for an unplanned trip. Soon they realize that it is going to be adventurous. The narrative begins in a crowded Delhi train. Soon it takes us through different places like Darjeeling, Sikkim, Kathmandu Nepal, Haridwar and finally Leh. The author has explained the smells and flavors in detail. It is so descriptive that we feel like a part of their journey. The story flows with ease and holds readers attention. In short, the book is a joy read, or should I say joy ride? It urges us to pack our bags and step out for an adventure! It takes you across places… Allows you smell the flavors unique to them… Enables you to meet new people and taste new cultures… So why not read it and indulge in couch travel? Jaico Publications for giving away the book for review. I'm always up for some adventure, and this story seems like a great read. I hope that you would enjoy it as much as I did! I've read only one book based on travelogues, and I liked it. Maybe I can try reading this sometime... Thanks for the reco. Yeah... and let me know if you liked it!!! Interesting. Would love to read how and where the Lassi comes into the adventurous plot. Good to read a flamboyant review, rather than a mere dissection of the book.